Ararat (2017. 305 pages) is a horror novel, written by Christopher Golden. 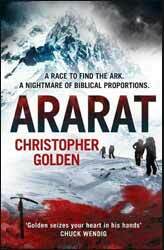 Ararat is one of the places thought to be where the ark finally came to rest. In the novel the cave is a long way above the snow line and so more than a little inaccessible, a necessary device to cut off the characters from the wider world and so increase their isolation and ramp up the threat level. The best thing that can be said of the novel is that it is very competently constructed in a very Michael Crichton kind of way. We are introduced to a number of characters; some are explored in detail while others are little more than brusque outlines, which gives you an indication of their survivability. As the story progresses the body count inevitably increases. I can find nothing wrong with the pace of the novel as Golden starts the story at a brisk pace which never really slows down, which makes for a very readable novel. The problem is that it just felt like a bit of a by the numbers plot. You never really get to care about what happens to the main protagonists even when they are under extreme threat. Partially this comes from the need to keep progressing the plot and ramping up the tension, a job which the book does particularly well, and partially because many of the characters are there for little reason except as fodder for the book's big bad. Overall this is a well written novel, which should entertain and maybe creep you out a little, but overall I found it lacking in sufficient originality. Well worth taking on a journey to while away the hours.